If you’re planning on running an online contest, I have a little disconcerting news for you: people cheat. It happens in contests of all sizes, no matter the prize or premise. You may think, “My contest is immune to cheaters – I’m just giving away a few bottles of nail polish.” But I’ve seen cheating happen in the most unlikely scenarios – in a kid’s art contest, in a church summer camp’s internal talent contest, and even in a giveaway for blue nail polish. As a Help Desk agent for an online contest builder, getting frantic support requests about cases of potential cheating always dulls my day’s sparkle. But the reality is, my team and I answer far fewer questions about how to prevent cheating than we do about how to prove that someone has cheated. With quality contest software and a little pre-planning, you can keep cheaters at bay. Now, the good news: with quality contest software and a little pre-planning, you can keep cheaters at bay. I’ve listed out some of the features you’ll need to employ when using an entry form and/or collecting votes. I’ll also go over general good measures to implement for cheater-prevention. First, before we start talking about deterring the human cheaters, let’s talk about the robot spammers. 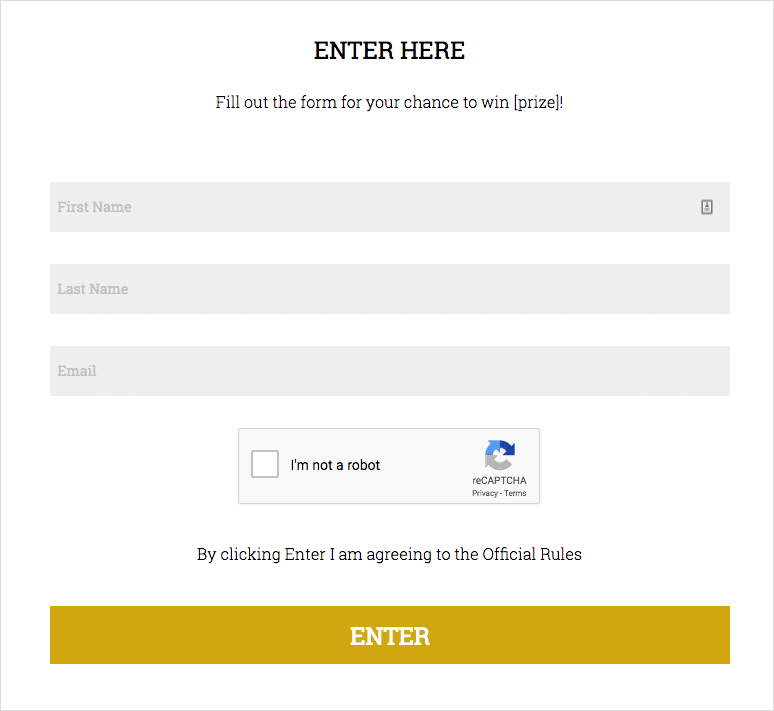 If you want to ensure all of the entries submitted to your entry form were created by actual humans and not bots looking to fill your list of entries with spam, add a CAPTCHA to your form. Captcha stands for “Completely Automated Public Turing test to tell Computers and Humans Apart” and is a simple way to do just that. 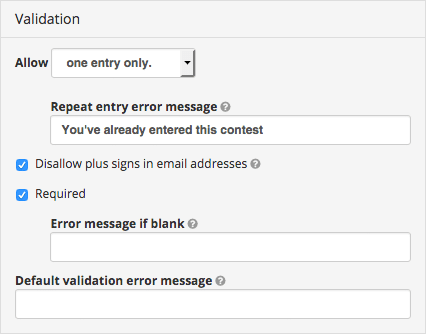 When running a giveaway or any type of contest requiring entry in an entry form, a good contest builder will offer a number of ways you can prevent duplicate entries. For example, ShortStack allows you to restrict entries by an email address, Facebook ID, or mobile number. 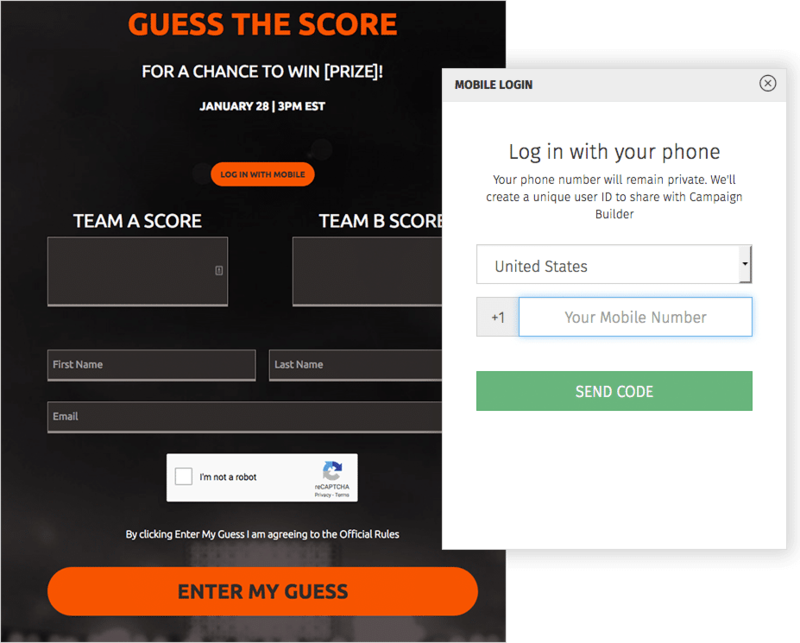 If you’re dead set on offering one entry per person, restricting entry by requiring a Facebook log in (i.e., allowing the contest software to see the user’s Facebook ID) or a mobile number, is your best bet because most people have more than one email account. Gmail allows you to create more than one email alias for your email address and directs all of the incoming mail for your email address and all aliases to one convenient place. Although, this feature can be handy in other scenarios, for contest hosts, it opens the door for unlimited entries. For example, my email address is jessica@shortstacklab.com. I can create an alias by simply adding a “+1” as in jessica+1@shortstacklab.com. Let’s say you’re a kayak manufacturer and your products appeal to a niche audience — outdoorsy folks who like to run rivers. You run a giveaway for participants to win a matching pair of your high-end white water kayaks, worth about $7,000. Would you rather see this prize go to someone who loves your company, someone who will use the kayaks, and fill their Instagram feed with pictures of your product cutting through epic white water? Or, to someone whose only interest in your kayaks, is to win a prize they can flip on eBay. Your contest could end up on one of dozens of contest sites, whose sole purpose is to list links to current contests and giveaways. Some contest hosts love these contest sites, because they can get contests a ton of exposure. However, if you’re like the Kayak manufacturer, you don’t want a bunch of couch potatoes who live in the desert entering your contest. If you find that the main source of your contest’s traffic is coming from a site with a suspicious name like “GiveawaysAllDay.biz,” you can block this domain, or any other domain, from viewing your contest. 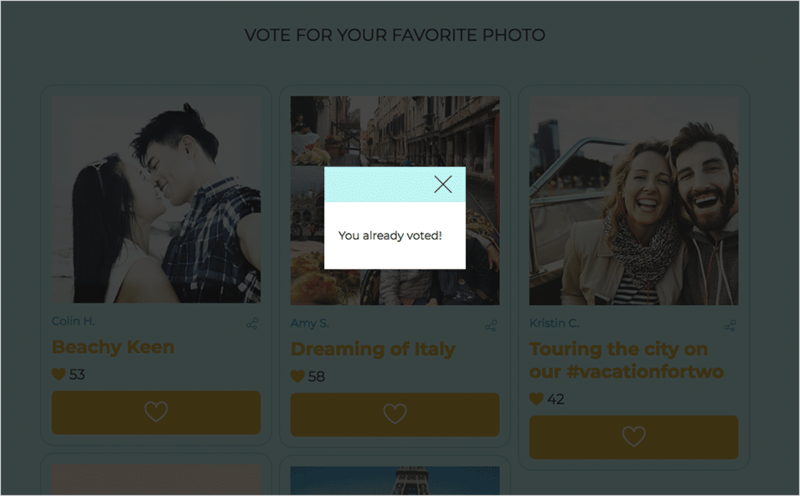 A good contest builder will offer a few ways to restrict votes. ShortStack offers the ability to restrict votes by a Facebook Log In, a mobile log in or an Anonymous Fingerprint. The Anonymous Fingerprint uses a combination of a cookie and IP address to restrict votes. Restrict votes using features such as anonymous fingerprinting or Facebook Login. If you’re restricting the votes by a Facebook Log In, you can take it a step further and require that each user have a Verified Facebook Account. In some cases, people will create a fake Facebook profile for the sole purpose of using it to cast extra votes. Requiring a verified account is a great way to circumvent fake profiles. With some contest software, you can set up “if, then” actions. For example, in ShortStack, you can set up an action to only display the vote-able entries after the entry form is successfully submitted. This is a great way to add an extra barrier of security when collecting votes. And, as an added bonus, you’ll gather email addresses from all of the voters and be able to use them for marketing during the months and years to come. 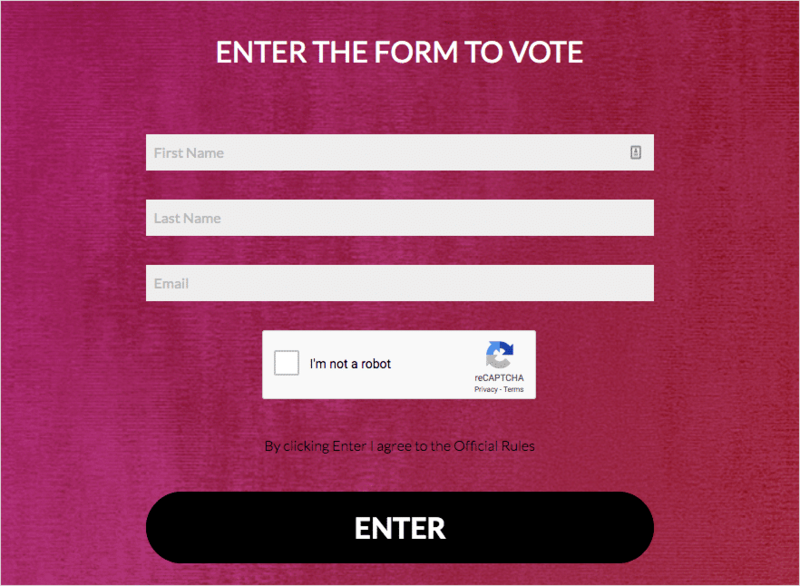 Entry form gating voting. Built with ShortStack’s Enter to Vote Giveaway. Although this won’t do anything to prohibit casting extra votes, it can help deter voter fraud. If the end user isn’t able to see the tally of votes cast for each entry, no one will know who’s in the lead, thusly, deterring a cheater from looking for ways to take the lead. 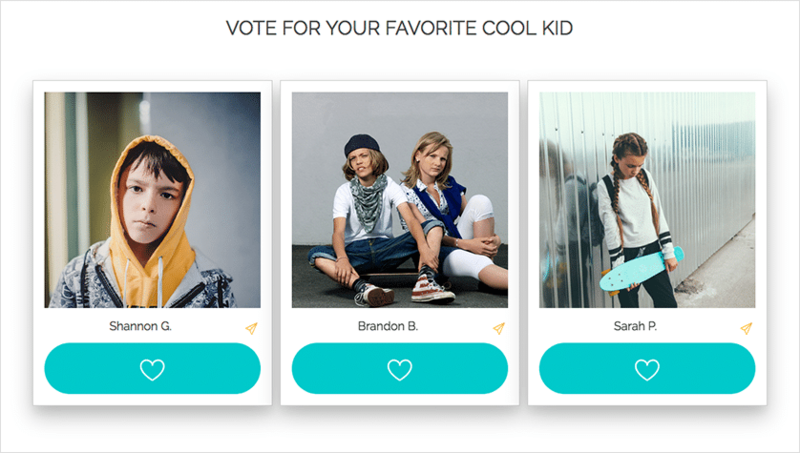 In the kid’s art contest I mentioned earlier, one participant would receive a few votes, and then, immediately after, another participant would receive a few more. Every time the first participant got a few votes, the other would get a few more, always staying in the lead. The parents of the first participant became furious and absolutely convinced that the other participant was cheating. Whether cheating was actually happening, or it was just coincidence, if the vote tallies hadn’t been displayed, the entire conflict could have been totally avoided. Often times, when cheating happens, it occurs at the very end of the contest. One participant is in the lead for a long time, then on the last day of the contest, another participant’s votes shoot up by a suspicious number. If the vote tallies are hidden, it would be hard for a cheater to know the margin they need to win the contest. Knowing that cheaters are out there can help you write your contest’s terms and conditions with the necessary added caveats. For example, you can include a stipulation that states you have the right to disqualify anyone suspected of cheating. Sometimes, the burden of proving cheating has taken place can be just as painful as handing your prize to an undeserving contest participant. Sorting through spreadsheets of timestamps and IP addresses, flagging fake email addresses, or fake Facebook profiles can be grueling work. Save your team the headache of playing detective and include a “We will disqualify suspicious entrants” stipulation in your contest’s terms and conditions. When it comes time to choose a winner in your voting contest, it’s always good to have a plan B. Whether you know from experience or, just from reading this article, no matter how much technology you use to prevent voter fraud, there’s someone out there working to figure out how to cast more votes. If cheating is suspected, reserve the right to choose a winner by a different means – by a panel of judges, by you, or even by a random selection. If you don’t want all of the votes to go to waste, you can still incorporate vote tallies into your selection process, without using them as the sole means for choosing your winner. For example, move the five entries with the most votes into a “final round,” and have a panel of judges choose from these top five. If the suspected cheater is included in this round, there’s still no guarantee they’ll win. A good contest builder will always be working to stay ahead of the voter/entry fraud trends. ShortStack is currently working toward adding more features to its arsenal of voter and entry fraud prevention. Sign up for our blog at https://www.shortstack.com/blog/ and stay tuned for feature updates.